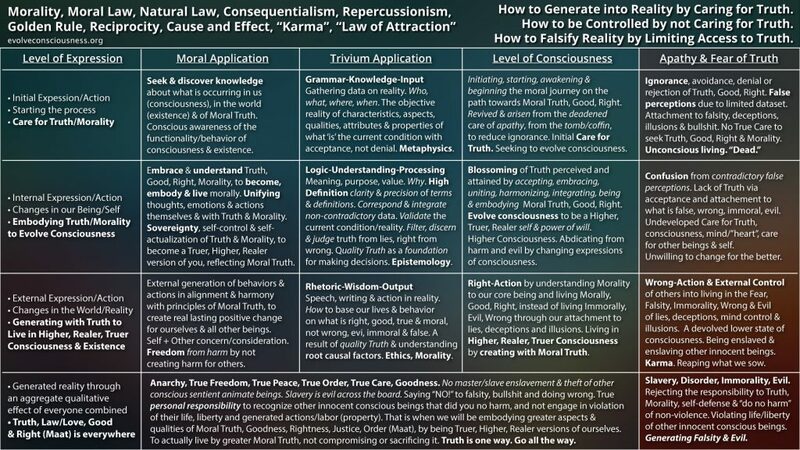 A chart corresponding Morality, Consciousness Evolution and the Trivium Methodology. It demonstrates the processes of internal changes, affect, influence and generation in consciousness that results in external changes, affect, influence and generation in existence/reality by Caring for Moral Truth, or rejecting it in apathy, cowardice and fear. We can create varying degrees of a “Heaven”, or “Hell”, internally and externally. Anarchy, freedom, peace, prosperity, etc., or chaos, slavery, war, scarcity, etc. Truth or consequence. Be right, or go wrong. The power of consciousness to influence, affect, change, alter and generate into reality/existence is up to each one of us to develop. This is an updated version of a previous chart I made in 2014, which also has a video. If you watch the video/audio to hear me explain it at the time, please take some terminology as merely symbolism, and not literal, as I mentioned in my previous steemit post. Such terms purported as alleged “truth” are imagined beliefs in external allegedly “existent” things like an imagined “Higher Will”, “Higher Self”, “Spirit”, “God”. These are symbolic terms to refer to Moral Truth as a reified, objectified, externalized, deified “existent” thing in itself, when it is not. My development in learning how to think and learn, especially about Language, Symbols and Reality, has revealed these errors in belief constructs I had been influenced to accept, that are not veracious, verifiable truth(veritas)/reality/existence. I recommend using the updated version above and understanding it, unless you really need some explanatory commentary to assist. Thank you for this consideration and understanding, and my apologies for this possible confusion if you listen to the video/audio. Peace.